As the holiday season is upon us consumers are decorating and buying gifts for family and friends. At the same time, scammers are preparing their holiday scams to “deck their halls” with your money, privacy or identity. 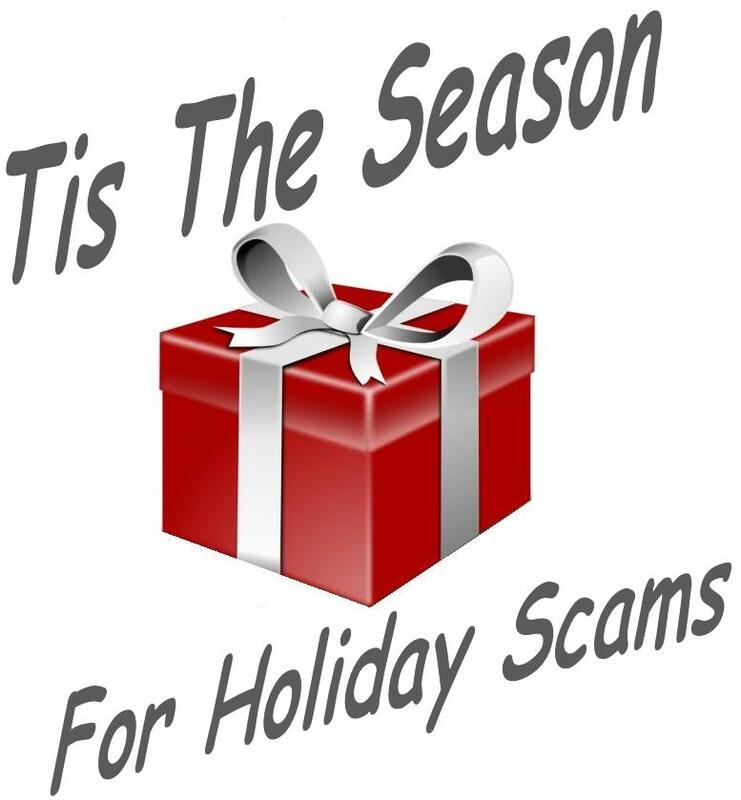 Below are 12 common holiday scams as well as ways to make sure the scammers, and not you, end up with a bag of coal. Dangerous E-cards: can contain malware or viruses. Emergency Scams: scammers pretend that one of your friends or family members is in an emergency and need money immediately. Fake Charities: scammers pretend to be a charity and keep your donation. Foreign Lottery Scams: notices are usually accompanied by a request to “advance” some portion of the alleged win, usually to cover taxes or processing fees. Gift Cards With Nothing to Give: gift cards that either are for on-existent businesses or that have already been used. Holiday Grab and Dash: scammers and thieves steal your gifts, purse, wallet, credit or debt card. “Hot” Holiday Gift Scams: online offer for the “hot” holiday gift that is sold out everywhere else; scammers claim to have the gift. Malicious Mobile Apps: these apps access your personal information and send it to the scammer. Phony Websites: these sites try to steal your money and personal information. Social Media Scams: almost any scam can be done through social media such as Facebook and Twitter. Travel Scams: be cautious of “special” travel offers; they may be fake or may have hidden fees. Beware: be wary of “special” offers, prices way below other sites and similar things. Depositing Money: always make sure a check you deposit has “cleared” before spending any of the money. Do Some Research: check our charities and companies with the Better Business Bureau (http://www.bbb.org/) or other trustworthy organizations. Double-Check: do not hesitate to double-check any deal or request. Emails and Text Messages: Do not open attachments or click on links from people or companies you do not know. Guard Your Stuff: keep track of your merchandise, phone, wallet, purse, credit and debit cards. Never: never give your personal or financial information to someone who has contacted you requesting it; if in doubt, get a phone number and call back to ensure that it is a legitimate request. Online Purchases: pay for online purchases with a credit card as you have more rights in disputing wrongful charges or if you do not receive your purchase. Protect Your Computer: make sure you have anti-virus and anti-malware software, and updated it frequently, installed on your computer. Review: your credit card and debit card statements often, even more frequently than once a month when you get your statement, to make sure there are no illegal or unauthorized charges. Secure Online Shopping: confirm your online purchase is secure by looking in the address box for the “s” in “https:” and in the lower-right corner for the “lock” symbol before paying or providing your personal information. One of the easiest way to detect a scam is to trust your instincts. In addition, remember if something sounds too good to be true, it probably is. By taking these simple precautions you can protect yourself from most scams. Lapin Law Offices wishes everyone a fun and scam-free holiday season. Lapin Law Offices represents clients with caring, passion and dedication.